Bitter rot has been recognized as a disease of grapes since 1887. The name was derived from the bitter taste that develops in infected berries. If 10 percent of the berries used to make wine are infected with bitter rot, the wine may be undrinkable. The disease is more common in the southern grape growing regions of the United States, and could become a serious problem in southern Ohio. Figure 1. Grape berries infected with bitter rot. Bitter rot is easily confused with black rot, which is a common disease of grapes throughout Ohio. The ability to distinguish between these two diseases could be vital for growers and especially winemakers. Bitter rot can affect young shoots, stems of fruit clusters, pedicels, and fruit. If cluster stems are infected and killed early in the season, berries do not develop and remain attached to the stem. When cluster stems are infected late in the season, berries may fall off the bunch. This “shelling” of berries may be an important sign that bitter rot is occurring. The most obvious symptoms of bitter rot are on berries. 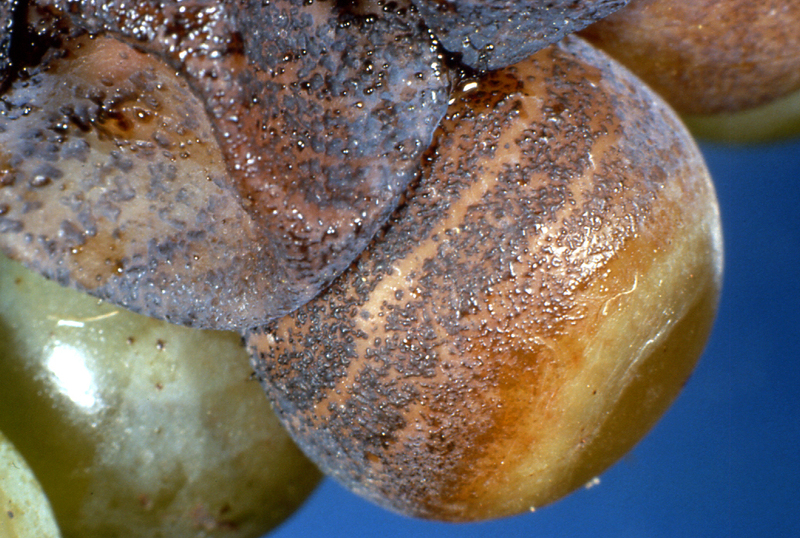 The first symptom is a brownish, water-soaked lesion that develops on maturing fruit. Bitter rot is a ripe rot of grape, and unlike black rot, does not infect green berries. This lesion spreads rapidly (often in concentric rings) and within a short period of time the entire fruit is affected. These infected berries usually maintain their shape and are dull brown in color. In 2 to 3 days the skin of the berry is ruptured (more or less uniformly) by black pustules (fungal structures). Under moist conditions these pustules may coalesce to form irregular blisters over the fruit surface. The fruit skin is often torn by this point and the fruit shrivels in to black mummies closely resembling those of black rot. If berries become infected when they are overripe, the entire berry may become infected and fall off before the pustules form. These infected but temporarily symptomless berries are usually the most bitter, and unfortunately, the most likely to be harvested and pressed (along with healthy grapes) into wine. It is a common practice to leave wine grapes on the vine past maturity in order to increase sugar content. This could become a dangerous practice if bitter rot becomes established in the vineyard. Figure 2. Close-up of fungal fruiting bodies on grape berry infected with bitter rot. Note the arrangement in a ring-type pattern. Bitter rot of grapes is caused by the fungus Melanconium fuligineum. The fungus overwinters in the vineyard on almost any plant debris, especially berry mummies. Spores (conidia) are produced from cushions of fungus tissue (acervuli) growing on plant litter. Fungus growth and spore production are favored by warm, humid and rainy weather. Spores are spread by splashing rain. Symptoms develop on berries one week after spores reach a healthy berry and in less time if the berry is wounded. The fungus colonizes the entire berry, including the seeds. Acervuli develop in the fruit skin, rupturing it as they mature. Conidia in the acervuli are spread to other plant parts by rain. In Ohio, bitter rot increases in severity the farther south grapes are grown. Promote good air circulation and light penetration by controlling weeds and suckers, proper pruning, and positioning or removing shoots for uniform leaf development. Where possible, rows should be planted in the direction of the prevailing wind. Good air circulation and light penetration will promote faster drying of plant parts and reduce disease incidence. Prevent wounding of berries by controlling insects, birds and other grape diseases. 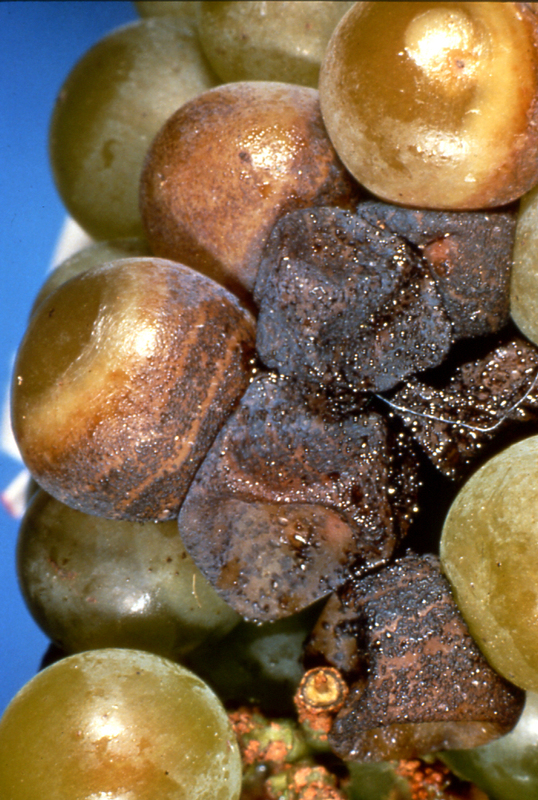 It is important that growers and winemakers be able to distinguish between bitter rot and black rot. Because black rot infects only green berries, the fungicide sprays for controlling it are generally stopped when berries begin to change color. Stopping sprays at this time could be disastrous if bitter rot is present because it infects fruit only after the berries have changed color. The table above is a list of characteristics that should be helpful in distinguishing between the two diseases. The fungicide spray program that is recommended for control of the more common grape diseases should be beneficial in controlling bitter rot. Specific sprays for controlling bitter rot are generally not required in Ohio. For the most current fungicide recommendations and spray schedules, commercial growers are referred to Bulletin 506, Midwest Fruit Pest Management Guide, and backyard growers are referred to Bulletin 780, Controlling Diseases and Insects in Home Fruit Plantings. These publications can be obtained from your county Extension office or the CFAES Publications online bookstore at estore.osu-extension.org.